Firewind are a new metal band, that includes into its lineup the famous Greek guitarist Gus G (Dream Evil). It must be said since the beginning that this is no “common” powermetal album. The ideas are all there, although in an embryonic stage, although the band should mature yet to be a full grown smash-hit. Most of the music here remembers “soft” bands like EdGuy, but the Firewind are more aggressive, and more hard – giving this albm a good and powerful hint of “heavy power” that is lacking to most modern metal productions. But the first thing that comes to the eye (and ears) is the duration of songs… they don’t even reach the 4 minutes. If this will be a good or bad idea, that is for the audience to decide. But let’s take a look at the songs. The opener, Kill to Live, starts this album with the aggressive notes of the guitar and doble drums of Kristoffersen. The harmonics of Gus G and the general style of guitar pays homage to names such as Michael Romeo, and even the vocals of Chity Somapala pays tribute to those who are the new “inspiration” for most new band, that is Symphony X. The voice is rough and evil, and the song allows for good listening. The bridge and refrain, however, are a bit on the “already listened” side. All in all, a good song with no elements of novelty. Good the solo, very “maidenian” in style. Beware the Beast again starts with the guitar in full evidence, hammering its way through the sound wall of bass and drums. Keyboards are – like in the first song – very limited, and the song is again in the standards of metal, with a good mix of classic and power both in the vocal line and in the instrumental parts. Good bass work (by Petros Christo) – yet almost hidden as the guitar phases in and out in the beginning section of The Forgotten Memory. Here the voice of Somapala rises in intensity, almost pushing to its limits, until the slow, cadenced (and very hard rock) refrain kicks in. Hate World Hero starts with a clean arpeggio supported by a good performance of the bass guitar and an almost vibrato vocal line. If Kristofferssen did not equalize his drum sounds in a power metal fashion, this song would have been in good company of the almost epic style songs of the “soft” hard rock a-là Bon Jovi or Whitesnake. In my opinion this is the less interesting song of the album, but many of you will surely find it good – if you like the genre. We return to something a bit heavier with the next Escape from Tomorrow. This time the atmospheres are good and the arpeggio of guitar is rich and good, while the drumming is very varied from a hard rock style under the main vocal line, to the typical cadenced double bass drums of the powermetal style refrain – which comes almost ex abrupto without preliminary bridge. It seems that in this song Firewind put most of their energies, although the final result strongly recalls to mind bands like Edguy. As usual a good massive hammering from the guitar and bass follow the heavy drum line creating a nice “sound attack” against the ears of the listener. Pleasant, to be honest. We come to a brutal awake with a fierce guitar and – almost a miracle! – the first serious use of keyboards (just as pads) in Feast of the Savage, where Gus G shows us all his prowess with his “weapon of choice”. Darker, sharper sounds for the six strings (and for the bass drum, as well), as the keyboards create a simple yet efficacious carpet of sounds, that abandon us at about half of this song, which is one of the longest tracks in the album (4:21) being also – I did not mention it before – an instrumental piece. Well… not bad and nice to listen to, with good ideas sprinkled here and there. Too bad that the intensity of the song fades at half of is length, leaving us with a beautiful but sort of “incomplete” song. However this track is in my opinion the best of the album. Intense, well played and well mixed. Second to the 7th track in my opinion is the following Burn in Hell, which clearly winkles to crossover. Aggressive, relentless, almost a march of hate, this Burn in Hell is another interesting example of what Firewind would do if only they could detach themselves from the standards. Again the guitar does a good work and again the keyboards are lacking, somewhere in the faded tracks, maybe. And of course if you burn in hell… you will be Perished in Flames, which is the almost logical following song. This time we are in the purest hard rock – which I personally don’t like. Well played, again, but I think this song is the least interesting of the whole album. If you like hard rock you may like it, otherwise just skip it… there is only a slight piece of light in the song, the ending section with its change of tempo, and the darker distortion of guitar. The album closes with Land of Eternity, with its arpeggio of guitar, counterpointed by the bass and – lo! A keyboard in the distance! This song is the melancholic piece you’d expect in this style of metal and by far the longest song in the album (5:50). A typical ballad with the good company of usual strings, female choirs and guitar. What could I say of this album? Firewind put up a decent defense of their genre, which is a genre I don’t like very much; but they are still too tied to the typical features of this style of music. Yes, the ideas are there, as I said. And yes, these guys can play them well – but it looks like they did not have the courage to spread their wings and fly away from the cozy comfort of their nest. Surely Firewind are a band with good promises and I am pretty sure that if they will let this wind blow in the right direction, they will set ablaze many stages in the metal world, but they must uncorck the wineskin where Aeolus placed their wind of fire and set it free. And finally (I’m sorry, I’m a keyboard player): where are the keyboards they’ve mentioned in the line-up? Poor Katsionis, in my opinion, receives far less than his rightful share of the album. I think that a more intelligent and more generous use of keyboards would have made this album even better. 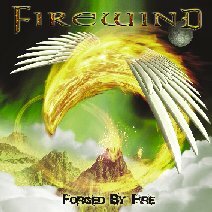 All in all a good first try, but Firewind have to become even better if they want to blaze like comets in our skies.